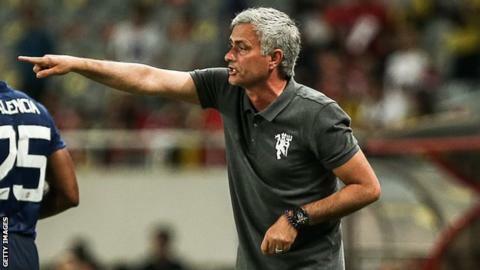 Manager Jose Mourinho said he was not worried after his Manchester United side lost 4-1 to Borussia Dortmund in a pre-season friendly in Shanghai. Gonzalo Castro scored twice for the German club, with Ousmane Dembele and Pierre-Emerick Aubameyang also scoring. New signing Henrikh Mkhitaryan netted United's goal, making the score 3-1 just before the hour mark. "It was like Formula 1 against Formula 3," said Mourinho. "They are much sharper, so it was difficult to judge." The Portuguese, who succeeded Louis van Gaal as manager in May, said Dortmund had shown their pre-season preparations were at a more advanced stage. "One team started training a month ago and played four games," he said. United continue their pre-season tour on Monday with a match against Pep Guardiola's Manchester City at the Beijing National Stadium. They will then return to Europe to face Galatasaray in Gothenburg on 30 July.